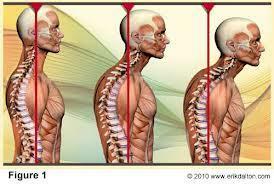 POSTURE CAN MAKE OR BREAK YOUR BACK AND NECK PAIN. ABOVE..AS THE SERIES PROGRESSES, THE HEAD CARRIAGE DROPS FORWARD MORE AND MORE. FOR EVERY 1cm YOUR HEAD FALLS FORWARD WITH POOR POSTURE, YOU ADD 10lbs OF PRESSURE DOWNWARD AND COMPRESSING YOUR SPINE WITH EXTRA WEIGHT. WORK HARD AT MAINTAINING PROPER POSTURE, AND YOUR CHIROPRACTIC VISITS WILL GO MORE SMOOTHLY AND EVENTUALLY BECOME MUCH LESS FREQUENT! WE LOVE TO HAVE YOU HERE IN THE OFFICE, BUT STRIVE TO MAKE YOUR VISITS LESS FREQUENT DUE TO PROGRESS: LESS PAIN AND MORE OPTIMAL HEALTH!! 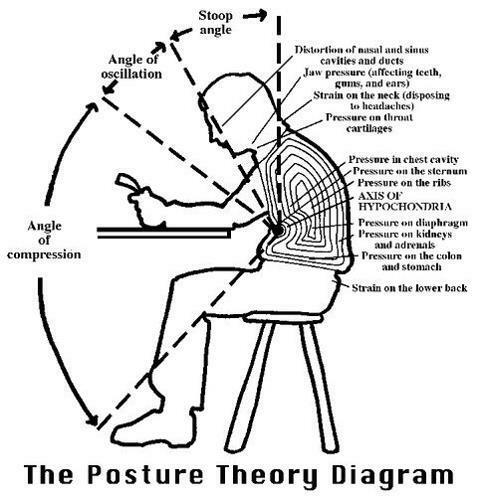 ABOVE ARE 2 DIAGRAMS TO SHOW PROPER ERGONOMICS / POSTURE WHILE SEATED AT YOUR WORK STATION. 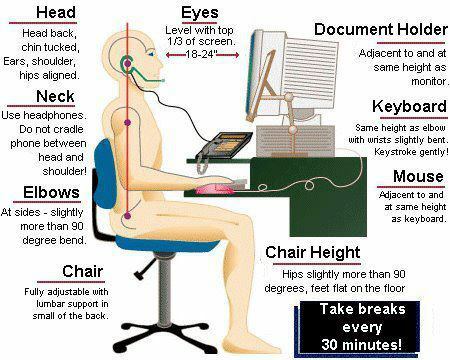 BE SURE TO STAND UP EVERY HOUR WHILE AT WORK FOR AT LEAST 5 MINUTES. TAKE THAT TIME TO STRETCH, MOVE AROUND AND LOOSEN UP. STRESS AND IMMOBILITY WILL NEGATIVELY AFFECT YOUR DISPOSITION. THE 5-10 MINUTES YOU SPEND MOVING AROUND AND STRETCHING WILL MAKE BIG DIFFERENCES DAY TO DAY! !